A premium road preservation technique. eFlex, a premium micro surfacing treatment, is a proven roadway preservation method. More durable than conventional micro surfacing, eFlex is a mix of crushed aggregate, mineral filler, and latex-modified, emulsified asphalt that is applied via mobile mix paver. 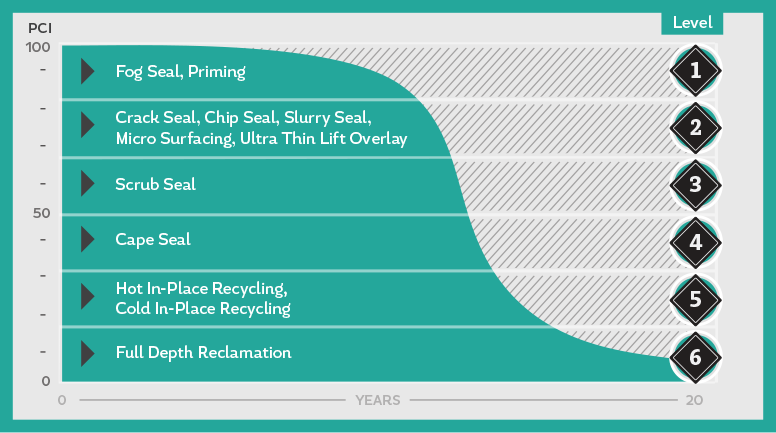 The major difference between conventional micro surfacing and eFlex is the significantly higher level of polymer modification. At an average cost of $3.25 per square yard, premium micro surfacing allows for a life extension roughly six to eight years at a fraction of the cost of major road reconstruction. eFlex is often chosen for roadway preservation for several key reasons. Any road type can be micro surfaced, making it versatile to work with. eFlex inhibits oxidation and raveling and can be used to repair ruts, fix minor distresses, level roadway profiles and increase surface friction. Although eFlex can be used for these serious issues, it should not be used to repair unsealed cracks that are ¼” or greater. Other preservation treatments can address that type of distress. eFlex is Ergon Asphalt & Emulsions’ premium micro surfacing treatment. Follow a prepared mix design. Seal all cracks ¼” or greater prior to application. Use specific micro surfacing equipment. Clean and prepare the intended surface before application. Protect treated area from traffic until sufficiently cured. Use specialized rut fill box to fill ruts ½” or larger. Allow ruts 24 hours to cure under traffic before applying surface.